Carbolytic enzyme-associated cascades have been considered as potential curative target in attenuating diabetic mellitus pathogenesis. Two oleanene class of triterpenoids characterised as 24(4 → 23), 27(8 → 26), 30(20 → 29)-tris-abeo-olean-(12-oxo)-1,15,22-triene-methyl hept-5-enoate (1) and 24(4 → 23)-abeo-olean-(12-oxo)-3,5-diene-deconoate (2) with potential inhibitory activities against the starch digestive enzymes α-glucosidase and α-amylase, were purified from the organic extract of intertidal red seaweed Gracilaria salicornia (family Gracilariaceae). Structural interpretation of compounds was carried out by detailed spectroscopic analysis, and their antioxidant/anti-diabetic potentials were assessed. Inhibitory potential of abeo-oleanene derivative (2) towards the starch digestive enzymes, α-glucosidase (IC50 0.29 mM) and α-amylase (IC50 0.32 mM) were greater than those displayed by its abeo-oleanene chemotype 1 (IC50 0.34–0.40 mM). The molecular modelling studies were performed to designate the α-amylase and α-glucosidase inhibitory mechanism of oleanene analogues, and the comparison of docking parameters suggested that compound 2 exhibited least binding energy of −10.04 and −9.84 kcal mol−1 towards α-amylase and α-glucosidase respectively, and those results were corroborated with its greater inhibition potential against carbolytic enzymes. 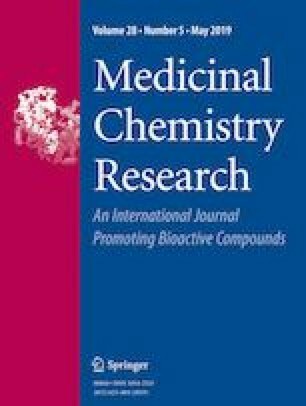 These results demonstrated that abeo-oleanene derivative (2) might constitute prospective anti-hyperglycaemic pharmaceutical candidate to moderate the likelihood of type-II diabetes. The online version of this article ( https://doi.org/10.1007/s00044-019-02328-2) contains supplementary material, which is available to authorised users. The present work was supported by Science and Engineering Research Board (SERB) (grant number SR/S1/OC-96A/2012) of Department of Science and Technology, New Delhi, India. The authors thank the Director, Indian Council of Agricultural Research-Central Marine Fisheries Research Institute (ICAR-CMFRI), and Head, Marine Biotechnology Division, ICAR-CMFRI for guidance and support.